Live streaming from the Danyliw Research Seminar on Contemporary Ukraine is available at http://krytyka.com/en/danyliw2015. 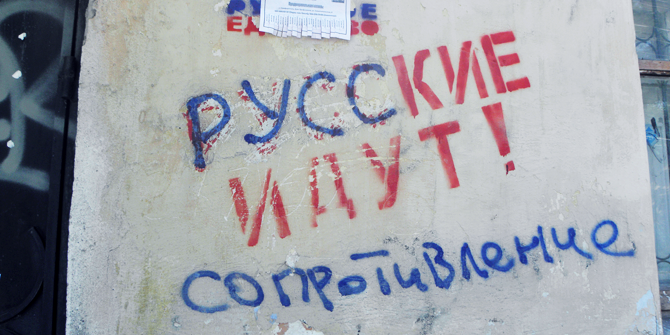 What does it mean to be Russian in Crimea? This should now be phrased in past tense because, following Russia’s annexation of Crimea in February 2014, being Russian in Crimea has become a different experience. It is now associated with being not only ethnically Russian but also with a political status, of “becoming” a Russian citizen, in a territory which is situated in the no-man’s land of international law as a de facto annexed territory. Rather I now ask: what did it mean to be Russian in Crimea (in the period preceding the 2014 annexation)? I’m interested in this question because it has been a largely taken for granted idea that Crimea is a region populated by a Russian ethnic majority population. Many of whom, preceding annexation, were seen as more loyal to Russia than Ukraine, if not holders of Russian passports (although in 2012 and 2013 I could not find anyone with Russian citizenship and/or a Russian passport), supportive of Russian nationalism and pro-Russian sentiment, if not separatism. Since annexation, understanding what it means to be Russian in Crimea has become more salient because ethnic Russians are often the overlooked community, as presumed endorsers of the annexation. I acknowledge, of course, that Crimea’s ethnic minorities—notably Crimean Tatars and ethnic Ukrainians—have faced increased, and horrendous, discrimination since annexation, from the closure of schools, to arrests and violence. However it is often presumed that ethnic minorities are the only losers of annexation. Aside from the social difficulties, for example the everyday disasters of banking, property rights, passports, Russia’s ban of methadone for (former) heroin users, human rights, democracy, ethnic Russians in Crimea now exist in a territory where they have, culturally, ethnically and politically, to be Russian. However, the data that I collected in Crimea shows a much more fractured picture than the notion of a Russian ethnic majority, and the mutually exclusive categories of “ethnic Russian” and “ethnic Ukrainian” can explain. Instead I am interested, in everyday terms, in how being Russian is experienced, negotiated and subverted, and combined, or related, to ideas of being Ukrainian and Crimea, and situated vis-à-vis Crimea, Ukraine and Russia. The most ardent supporters of being Russian and of Russia—who I label Discriminated Russians—as individuals who feel threatened by Ukraine and victims of post-Soviet policies of Ukrainization. They felt marginalized within Crimea, and Ukraine more broadly, feeling that more prominence was now given to Ukrainian language, culture and interpretations of history, at the expense of Russian language, culture and interpretations. However these individuals were both a minority of respondents, and were politically active, associated with pro-Russian organisations, such as Russkaia Obshchina Kryma (Russian Community of Crimea) and Russkoe Edinstvo (Russian Unity). Hence, they were quite different to those respondents (i.e. the majority of those I interviewed) who were not members of these organisations. Rather, most identifying as ethnically Russian were able, and happy, to reconcile being Russian to belonging, politically, to Ukraine. As they described, having to watch cinema in Ukrainian (as was mandated across Ukraine) was not a “strangulation” of Russian language and culture, but just a “bad law”. There were also many respondents who subverted ideas of being Russian, either rejecting ethnic categories in favour of emphasising their political membership to Ukraine—who I label Political Ukrainians—and those who combined their identification as Russian, and with Russia, with their identification as Ukrainian, and with Ukraine, by identifying as Crimean. These two categories as I conceptualize them—Political Ukrainians and Crimeans—do not fit neatly with the mutually exclusive labels. This is precisely what makes them interesting and challenging to the idea that Crimea was populated by an ethnic Russian majority: how would these individuals, who hybridized their sense of ethnicity or rejected ethnic labels, identify in a census? This is why it is vital to engage with notions of ethnicity, and identity more broadly, in everyday terms, i.e. in terms vernacular individuals use to describe themselves, and to unpack the rationale of this identification. I emphasize in my research the complexity of being Russian in Crimea and problematize the idea that being Russian determined identification with Russia, and much less, support for the Russian regime under Putin. However, the story I tell of support for territorial reconfiguration, in other words support for secession or annexation, is much simpler. In the period preceding Crimea’s annexation by Russia there is a tragic irony to the evidence from my respondents which demonstrates the lack of support for secession and annexation. Simply put, most supported territorial status quo because they considered Crimea to be a legitimate part of Ukraine while others, primarily Discriminated Russians, preferred peace to war, believing that secession and/or annexation could only result in “bloodshed” and “conflict”, a cost they were neither willing to bear nor support. They conceived also that Russia did not want Crimea. However, just because there was a lack of ethnic instability, to the extent that most respondents supported territorial status quo, this did not mean that there was not political fragility. Rather respondents, regardless of identification, were antipathetic to the Yanukovych regime, and to Kyiv more broadly, who they saw as taking more from Crimea than they were willing to invest. In this scenario, Crimea’s autonomous status appeared more fiction than a political reality because Crimea could neither make it initiate its own legislation nor hire locals to positions of power, subservient to Donetsk-based clans and interests. There were clearly tensions existing in Crimea preceding annexation. However these can be explained more by the broader issues of political fiefdoms and a culture of endemic corruption, issues that continue to plague Ukraine, than by ethnicity. The greatest illustration of this is that, in spite of the diversity of identities within the ethnic Russian majority, there was relative homogeneity of concerns: socio-economic, corruption, disempowerment vis-à-vis Kyiv and support of territorial status quo. From this, Moscow should take note that Crimean residents neither like to be governed by corrupt, if not criminal, vested interests as post-annexation authorities exemplify nor from afar, whether by Kyiv or by “snooty Muscovites”.